Beginning on Monday 19 September, Twitter will roll out a previously-announced change altering which types of content count towards the character limit. As we reported on 24 May, tweets containing videos, GIFs, photos or polls will no longer have their character count reduced by the inclusion on the media. Until now, a tweet containing only text can include up to 140 characters (including spaces). However, including one or more photos reduces the available characters to 116. Likewise, when a GIF is inserted, the 140 limit drops to 116. And, with polls, the character limit also reduces to 116, however, each poll option (up to four) has its own limit of 25 characters. Clearly this is complicated and off-putting. So, starting on Monday 19 September, Twitter will roll out the change so that any tweet can contain up to 140 characters, even if it contains photos, a GIF or a poll. Mark Wilson, Creative Director of The Digital Zebra said “This is a sensible move by Twitter. 140-characters has become the conventional quota for tweets, offering the opportunity to demonstrate both brevity and clarity. 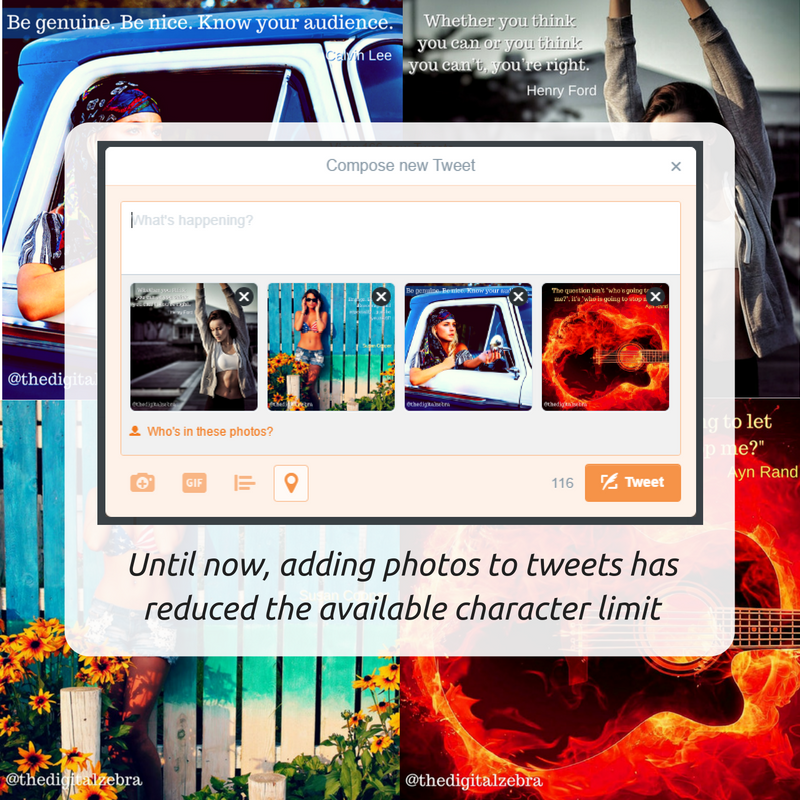 Now, a 140-character tweet can be appended with a compelling image, without the need to cut down text content. We should start to see even more creative, content-rich tweets as standard”. Other changes planned include the removal of a recipient’s Twitter handle from the 140-character count, where the handle is at the start of the tweet. It remains to be seen whether all changes will be rolled out simultaneously or in a succession of upgrades over a period of time.